Marshall Professor Dr. Paul Constantino holds a skull created in MU’s 3-D printer. HUNTINGTON, W.Va. – As a biological anthropologist and assistant biology professor at Marshall University, Dr. Paul Constantino studies human evolution. His research focuses on how the skull and teeth have developed and how diet has influenced that development. The shelves of his office are lined with life-size skull models illustrating the range of human evolution and his lab is filled with experiments designed to measure things like the force required to crack nuts and the jaw motions of giant pandas as they chewbamboo. Ironically, perhaps, for someone studying and teaching about humans who lived tens of thousands of years ago, Constantino is using one of today’s hottest technologies in his lab and classroom. 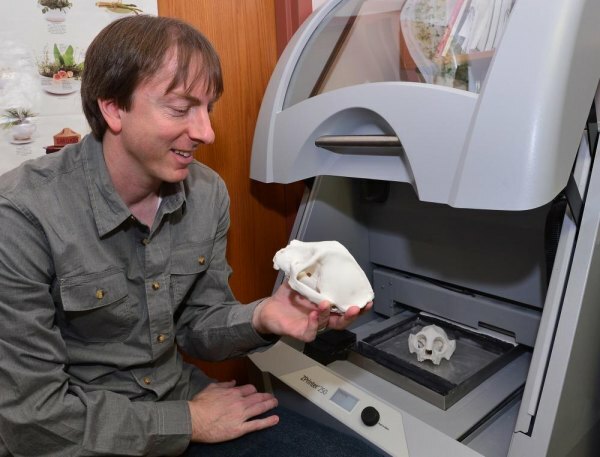 He recently bought a state-of-the-art 3-D printer to give students in his human anatomy courses hands-on access to replicas of specimens they are studying. Or, he adds, perhaps the actual specimen they want to see is one-of-a-kind and in a collection on the other side of the world. All Constantino’s team needs is a 3-D data file of the object and they are able to print a realistic model they can hold in their hands right here in Huntington. Constantino said they are continuing to expand their capabilities and have recently ordered a portable 3-D scanner to complement the printer. Constantino is working to get the word out that access to the equipment is available to other departments across the university. He said he can envision teaching and research applications in a number of fields, including engineering, science, the arts and medicine. “We want to make sure this valuable tool is used as much as possible. The equipment has to be run regularly to keep it in working order, so we are making it available to the university community,” he said. “We can provide scaled-up versions of whatever faculty and students might be studying—molecules or microbes, for instance. For more information, contact constantinop@marshall.edu. Constantino joined the faculty at Marshall in 2010. Prior to that, he was a postdoctoral scientist at George Washington University.